We’re a big fan of the raw aesthetic, but [Matseng] has also fitted the grid with a diffuser which more clearly represents that vintage computer aesthetic. We’re a big fan of the blinken here, such as this loving recreation of the PDP-8/I. Video after the break. I made something similar, but simpler. I used regular, cheap flashing red LEDs. They flash about a half second ON/OFF, but not exactly, no two seem the same. Mine is solar powered, charge the battery all day, blink for several hours at night. Just wire the LEDs in parallel, anyway you want. I did any 8×8 grid, just drilled holes in a sheet of plastic, pressed in the LEDs. I agree flip-flop is a bad name. theres no need to be confused on the internet though when encyclopedias are freely and legally available. There are two problems. One, the project author thinks that running transistors as switches constitutes an analog circuit. Maybe “there’s no C compiler for it” == analog to some people? Two, the article author thinks that a two-transistor oscillator is a flip-flop. I really don’t know where that one came from — the point of flip-flops is to latch, and the point of oscillators is to do the exact opposite of latch. I have an analog Core i7 processor in my computer. All of its transistors are analog. The question of being analog or digital has to do with whether you are discrete or continuous. This can apply for both voltage and timing of the signal, so a flip-flop that changes between two discrete voltage levels, or a light that changes between on/off can be analog if the switching time is not limited to discrete values. Think of a PWM signal. The signal level can be 1 or 0, which a naive person would say makes it digital, but fundamentally, the duty cycle is not discrete – it is continuously variable – making it analog in principle. It just depends on how you generate it. If by an RC oscillator, then it is truly analog. If by a micro-controller, then it is digital because it can only assume a number of discrete states. I agree that many text books would begin with a sentence very similar to your first, but after thinking about it, isn’t the name “digital”, meaning “finger or toe”, used to imply that the position of the element in a sequence has special significance? Is it more correct to say the defining feature of digital electronics is that the bits are arranged such that their position and state imply an unambiguous number, and not that each element is a system that can be in only one of a set of discrete states? I think so. Otherwise one would have to insist that a quantum computer is an analog computer, since its defining feature is that the qubits are not confined to a discrete set of states. Shouldn’t we instead categorize it as a digital computer, since its only meaningful output is the number represented by the value and position of the digits in its output register? Must an analog system be continuous? Is what we usually call continuous even really continuous? Aren’t there discrete tick marks on the dial of an analog meter? We can’t even say that time and space are continuous with conviction. In addition to your point that a PWM is to be recognized as an analog creature, I say one should also notice the nuance between discrete logic and full blown digital numeric representation. If one agrees with this reasoning then The Blinken Grid is appropriately called “All Analog” since, unlike the digital panel of the mainframe it mimics, the position of each light on the panel has absolutely no special significance. That brings back recollections of some of the main frame computers of many years ago, which did indeed have blinking lights. Although they were not LEDs, but were other things like incandescent, neon, and even nixie tubes for alphamerics (or, alphanumerics back then). Sometimes they had a notice on them that was in a near-German version of English phrases. The notice read something like: Achtung! Das machine ist nicht fur gerfingerpoken undt mittengrabben. Keepen das hands in das pockets, undt watchen das blinkenlights. It appears that the commenters either do not understand or recognize that these flashing leds lamps are driven by analog signals and analog drive electronics. This cannot be compared to digitally driven flashing lights. I’ve never seen a BJT circuit symbol the way Matseng draws them. Is this common? Not at all. The symbol appears to be drawn the way alloy junction transistors were built. These had a slice of N-type germanium, with P type diffusion on either side of the slice to form the emitter and collector. The arrow represents the emitter, with its direction being consistent with the diode symbol. Both the original point contact and later planar transistors had the emitter and collector connections on the same side of the die; the original symbol used by Bell Labs (and still today) reflects this type of construction. I did find an article by someone who was involved with standardizing the transistor schematic symbol. He said that GE and Bell used the symbol most of us are familiar with, while RCA and IBM used a different symbol, but he didn’t describe or show the symbol, so I’m not even sure that’s the one Matseng is using. 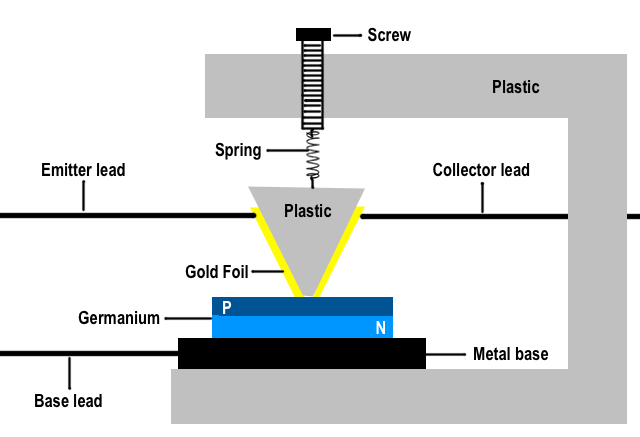 It had a plastic wedge with gold foils on the sides, forming the collector and emitter, pressed by a spring against a flat base plate made of a film of germanium on metal, the germanium doped in two layers to form a PN junction. Sigh. This place is filled with haters these days. At least with trolls that say “shickcock” (see Greater Internet Fuckwad Theory), can be purged, or banned. But these trolls will cut you a thousand times with nitpicking detail and take your cool thing down a notch. Valid criticism, even if it stings to hear it, is not ‘trolling’. The real shame here, is in this day and age people take such little pride in themselves that any negativity directed at them (warranted, or otherwise), is taken as some sort of grandiose personal attack. Being correct is and always will the most important point. That said, being corrected is not an attack, it’s a compliment if anything, as it means you get the chance to improve. Unless of course the person correcting you is wrong, in which case they should be promptly ridiculed for being a dummy. Yeah, pretty sure that’s not how any of this works. I see a circular movement in the pattern. I think the issue is that modern architectures are so fast and complex that you’re not going to get any useful info out of a few rows of blinken lights. That and tempest monitoring is a real threat with commodity hardware sdr and imaging devices available. Shaving pennies is still a big deal in quantity too I’m sure. And yes it’s probably cheaper and more flexible to use a display. This reminded me of one of the first problems I ever attacked with electronics (1970s). You have a battery box with whatever you want inside it. Another box with three bulbs and whatever electronics you wanted then only two wires connecting the two boxes. Light any one of the three bulbs according to switches on the battery box only. I remember it taking a while. Analogue only. Power and a modulated signal in three different frequencies, and decoupling capacitors to separate both? It is the only solution I can imagine. Aaargh, no, I’ve got enough projects! I think you can do four using that method, maybe more with more different voltage zeners and a few transistors. Don’t knock the blinkenlights. One of my earliest projects was a Z80, EPROM and small RAM. When it failed, some blinkenlights helped me find a small solder bridge between 2 address pins.